One certainty about the future of the rose is that there is still an extraordinary potential to be explored. Walk into any rose nursery in most of the country and you will find roses that were created by Tom Carruth. As director of Weeks Nursery, he has established a reputation as the most successful hybridizer in the United States today. He has joined the long list of West Coast nurserymen that have added greatly to the history of the rose in the United States. Centuries ago, wild roses that flowered only once a year were used in monasteries and private gardens, primarily for the medicinal value of their fruits. Once nurserymen discovered that roses could be hybridized, the race was on to produce as many as possible for the home garden. Henry Bennett (1823-1890), dubbed the “father of the hybrid tea rose,” was an English cattleman and among the first to hybridize roses. The once-blooming roses were superseded by the hybrid perpetual roses, themselves descendents of the Bourbon roses, in the middle of the nineteenth century; these frequently had a second show of flowers in late summer or early autumn. 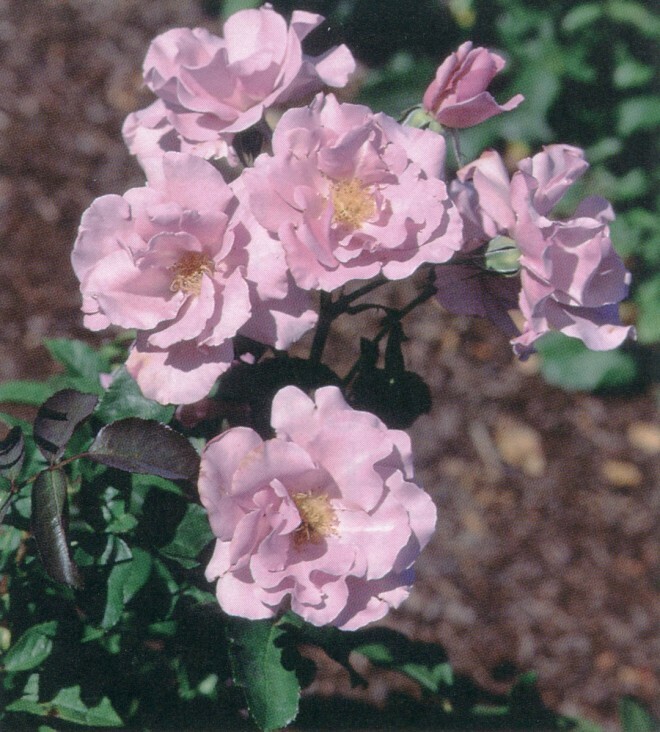 The introduction of the China rose (Rosa chinensis), with genes for reblooming, had a profound impact on the horticultural world; remontant (reblooming) roses began to be hybridized in great numbers and have dominated the market ever since. No other plant in the nursery has had such a storied history. Those who love old roses—albas, Bourbons, centifolias, etc—find appeal in their beauty, perfume, and history, even though they have a brief flowering period. In recent years many old and rare roses have found their way back to nursery lists. But the big sales remain with the modern reblooming roses, especially the hybrid teas. Before long, however, local nurserymen were trying their hand at creating new roses. 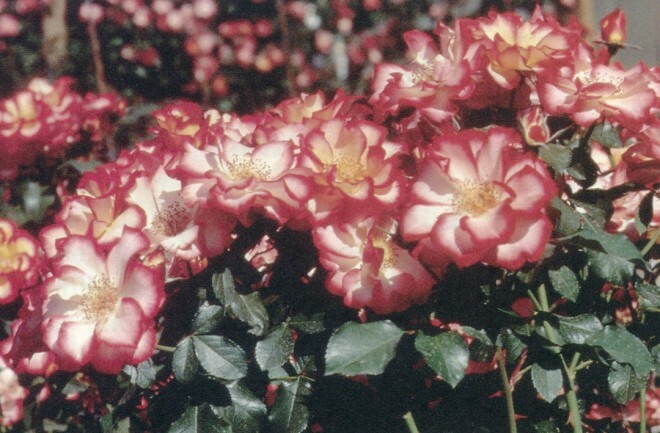 The boom in rose breeding occurred in Southern California, after the First World War. 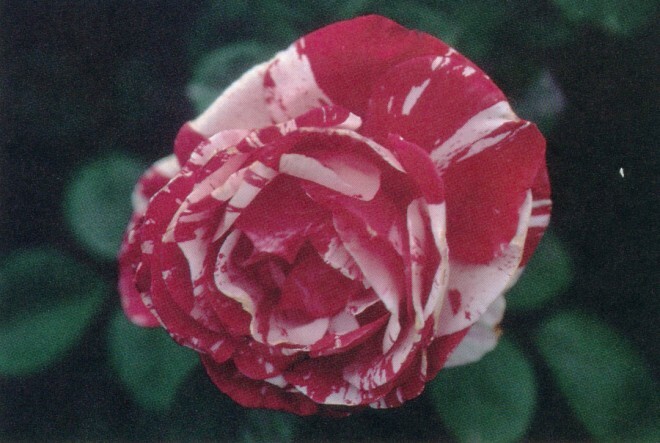 Nurseries such as Armstrong and Flowerland began introducing new roses every year. Walter Lammerts, Herbert Swim, Francis E Lester (see Pacific Horticulture, Summer ’93), Father George Schoener (see Pacific Horticulture, Spring ’95), Jack Christensen, Bill Warriner, and Ralph Moore gained internationally status as hybridizers. Moore, at 98, is still actively breeding and introducing roses from his nursery in Visalia. The best-known rosarian of the period was Fred Howard, one of five sons of Dr FP Howard, all of whom worked in horticulture at one time or another. By 1910, he had created the largest rose business in the US at his growing fields in Puente and at Flowerland, his enormous nursery in Los Angeles. In one record year, the nursery shipped two million bare-root roses to customers throughout the country. His introduction ‘California Centennial’ was honored by the state legislature as the official state rose. His most famous creation was ‘Los Angeles’, which won the Bagatelle Gold Medal in Paris in 1918. Mr and Mrs OL Weeks started their nursery in Ontario, California, in 1938 and maintained a successful business there until they sold it in 1985. The nursery moved to its present site in 1987. Weeks was consistently profitable, because he grew a limited selection and burned the excess from his breeding program. His most successful introductions were ‘Perfume Delight’ and ‘Paradise’; they and others are still in commerce. As there are changing tastes in clothing, automobiles, and furniture, so too with roses. A review of catalogs from the 1930s and 1940s shows that only a few roses offered then remain in commerce today. Fashion statements for 2003 suggest that orange roses are back in favor, patriotic names are popular, and landscape roses have increased in popularity for their ease of care, long flowering nature, and disease resistance. The big push by hybridizers to incorporate fragrance in their roses is now paying off, with an increasing number of new introductions notable for their appealing perfume. 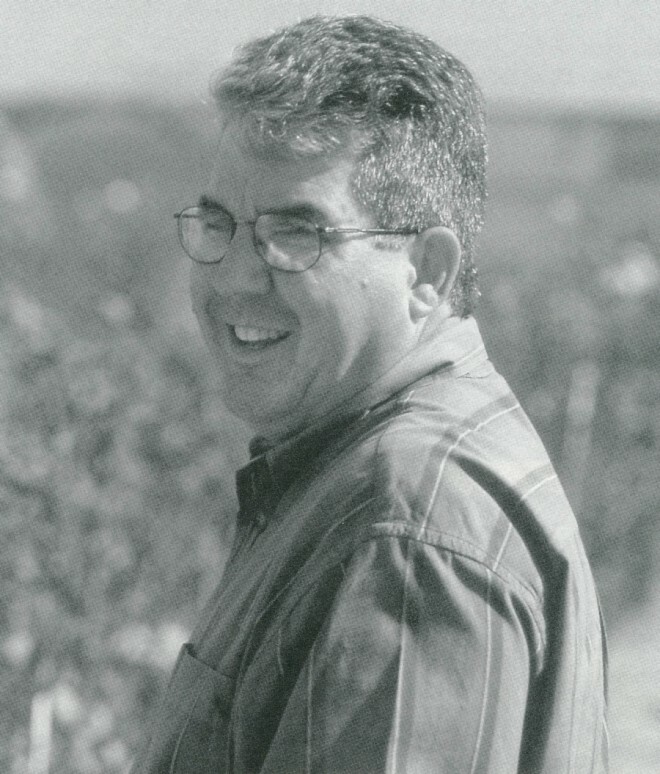 Tom Carruth, a native Texan and graduate of Texas A & M (with a masters degree in plant breeding), got his first job with Bill Warriner at Jackson & Perkins (J&P) in Tustin, California, in 1975. At that time, J&P was the most famous rose nursery in the US. He worked with this firm for three and a half years before moving to Armstrong, a well-known nursery that produces all kinds of plants in addition to roses. Here he worked under Herbert Swim and Jack Christensen. After seven and a half years, he left to become a salesman for Weeks; he has spent eleven of his twenty-six years with the firm selling and growing roses and fifteen years hybridizing new ones. “I fell in love with hybridizing in high school. My parents were bewildered with my interest in genetics.” Tom says his father never believed that he could make a career out of breeding flowers. Hybrid roses are the offspring of parents chosen to produce in their progeny certain characteristics, such as color, perfume, growth habit, and disease resistance. Seedlings from any cross will all be different from each other; in about three months, they will be ready for their first evaluation. Those that look promising are grown on and are observed as they mature. Selection is made at various stages of growth, based upon objectives established by the breeder; surprises always occur and may produce superior plants, an appealing perfume, disease-free leaves, or, most importantly, a beautifully formed blossom. This selection process continues for six years. The young hybrids are grown in different climate zones, on different soils, with and without fertilizer, with and without chemical sprays, in an effort to determine the sturdiness of the plants and their range of adaptability. Tom Carruth has always been fascinated with striped flowers in his breeding program. Nan Cocker of Scotland has been a big influence in this direction, as her firm specializes in off-beat colors and patterns. 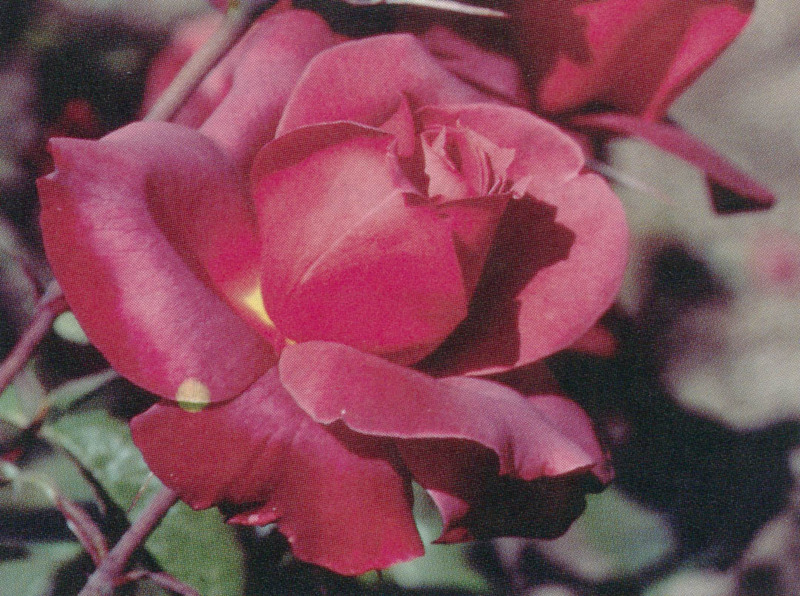 Carruth produced a world-class winner in his 1999 ‘Fourth of July’, a dark red, striped climber. (When the rose was purchased for release in Britain, the name was changed to ‘Crazy For You’ to avoid reminding the English of their lost colony.) 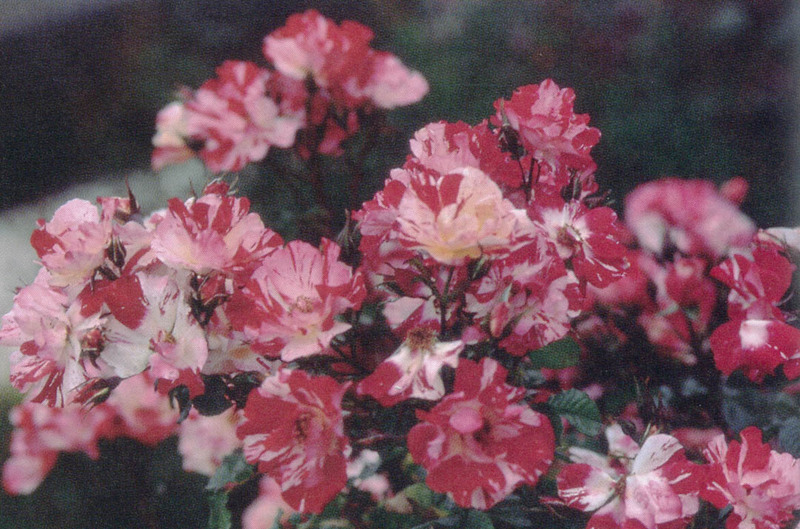 Earlier he had produced other striped roses, including these floribundas: the popular, red and white ‘Scentimental’ with a strong, sweet, spicy fragrance; ‘George Burns’, with a yellow, deep red, rose pink, and cream ruffled flower; and the bicolor ‘Betty Boop’, with semi-double blooms of red-margined petals surrounding a white and yellow center. He has just released a hybrid tea rose named ‘Marilyn Monroe’—a creamy apricot with a deep peach center. The blowsy, fully open rose is appropriate for its namesake. At the opposite end of the color spectrum, his ‘Outta The Blue’ combines shocking magenta and lavender pink. As one who has grown species and old roses most of his life, I never thought that I would be attracted to these flagrantly colorful new introductions. However, so interesting was ‘Hot Cocoa’, a floribunda described as “smoky chocolate orange,” that I purchased one as a small standard and placed it away from any other rose in my garden to avoid any clash of colors. I expect it will be a fine rose for flower arrangements, especially when paired with carefully chosen foliage. Asked what the future holds for his breeding programs, Carruth replied that “variation in size, form, and fragrance is a must.” He has moved into the production of roses grown on their own roots, which results in stronger and more disease-resistant plants. He recognizes the success that David Austin has had with his many releases over the past twenty years, wedding old rose form and fragrance with reblooming characteristics. Carruth is already planning his crosses for next year. He showed me the large greenhouses where the seeds from last year’s crosses have been planted, and many tiny plants were already appearing on the surface of the seed flats. Standards and weeping standards are ordinary fare in European nurseries, but only recently have American firms offered them. Carruth says that they have not been a hit with the public, so next year these will be discontinued. It is sad to see this happen as such roses, at various heights, are easy to maintain and can add greatly to the variety in small gardens. At his headquarters in Upland in January, with the weather in the 80s, a large crew of workers processed roses recently harvested from the growing fields in Wasco near Bakersfield. They were selecting, binding, pruning, and passing the bundles along conveyor belts to the packing room, where they would be shipped to nurseries all over the US. The enormous sheds formerly processed citrus harvested from the 6,000 acres of lemons and oranges that surrounded Upland when I was a child there. Much of the Weeks operation today is automated, including de-leafing machines necessary in the mild winter climate of Southern California. The test garden at the nursery gives Carruth a daily opportunity to watch the progress of his crosses as they grow into mature plants. During the high season, there are over 400 employees working in the large shed. More work in the fields in Wasco. Clever marketing is the secret of his and of Weeks’s success, especially when many other nurseries have experienced lower sales in recent years. 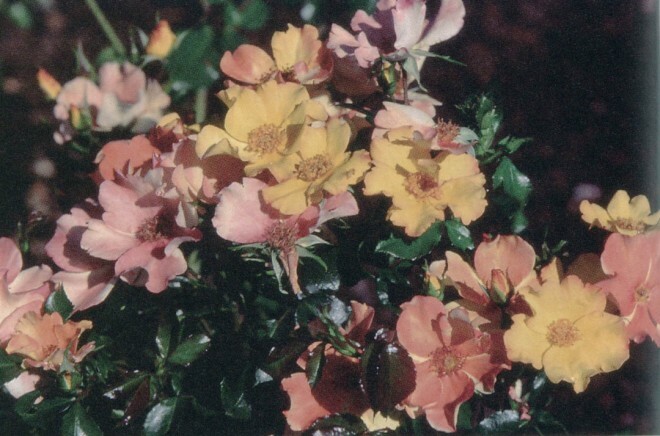 Tom Carruth continues to improve upon the modern rose, ridding this most cosseted of garden plants of its ailments, creating interesting color combinations, and always expecting the unexpected in his hybrids.